What is Curtain Wall Grouting and Why is it Effective? 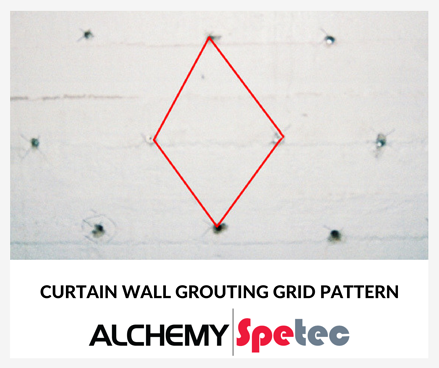 Curtain wall injection is the process of drilling holes through a structure in a diamond pattern, then injecting the grout into soil on the other side. This procedure creates a curtain wall made of a resin/soil mixture that prevents water from getting back into the structure. It is often required if there are multiple cracks or leaks in a wall. Filling each individual crack may cause you to waste time following the water from crack to crack. Curtain wall grouting allows you to stop multiple leaks at one time and protects the structure on a long term basis. This procedure was first performed in 1960 on a sewer manhole with a multiple leak problem. As described above, chemical grout was injected through to the outside of the manhole. This created a “positive side seal” (on the side the water is coming from), blocking water from penetrating the joints of the structure. This method is still used today and is the most effective method for grouting manholes to stop infiltration. It is effective on structures constructed from a wide variety of materials, including wood, steel, concrete, rubble walls, stone, block and brick. Injection holes are drilled in a diamond grid pattern (see photo included with this blog post). Grout injection begins at the bottom of the wall. Grout is then injected a little higher, so that any excess grouts flows down over the previous injection area. This creates a lapping effect, like shingles on a roof. Injection continues to the top of the wall. In addition to the “too many leaks” scenario, curtain wall grouting may be required when all cracks cannot be identified in a leaking wall, when previous crack injection has failed, or when a structure has a negative crack injection history. It is also used in masonry, dealing with stone and CMU walls that do not crack inject well. Material selection is based on various factors such as soils, voids, and moisture conditions. Call us at 404-618-0438 to discuss which material is right for your project. Want to learn more about this procedure?